Pendragon offer a selection of quality authentic reproduction cast iron fireplaces across the UK, including Georgian, Victorian and Edwardian era fires. Our fireplace casts are made in exactly the same way as the originals, so when fitted into period properties, it is difficult to tell if the fireplace is an original or not. The cast iron fireplaces are available as combination fireplaces or separate fireplace inserts and surrounds or mantels that can be combined to make up fireplace suites. Fireplace mantels are available in wood such as oak and pine or cast iron. Tiled fireplaces popular at the end of the Victorian era are also available along with a large choice of authentic fireplace tiles. Most of the fireplaces can be updated to modern living requirements by adding a gas insert, or can be used as originally designed to burn solid fuels. Most bedroom fireplaces are fitted for decorative purposes. For customers living throughout the West Midlands and the Birmingham area we can offer a complete fitting service. This involves any necessary building work to the chimney breast and installation for use as solid fuel or gas fires. We are also able to provide a chimney lining service for leaking flues. New products are being added to our website regularly which can be seen by logging on to www.pendragonfireplaces.co.uk. We now have our products available to buy online using our new improved Victorian cast iron fireplaces shop. 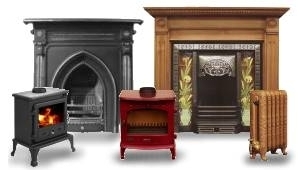 You are currently browsing the Pendragon Fireplaces Blog blog archives for February, 2010.